Publishers Weekly describes this book as "the most meticulously researched Lincoln biography ever written. 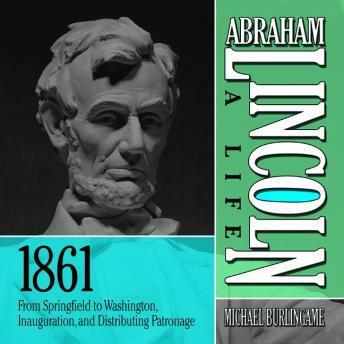 Burlingame's Lincoln comes alive as the author unfolds vast amounts of new research while breathing new life into familiar stories. It is the essential title for the bicentennial." Publishers Weekly also notes, "The book need not be heard in one sitting. Each part stands alone." Now Gildan Media brings to you, chapter by chapter, what Doris Kearns Goodwin calls a "...profound and masterful portrait." Lincoln agrees to undertake a taxing, circuitous, 1,900-mile train ride from Springfield to Washington in order to accommodate Republican friends in various states where they want him to speak. He alternates between giving hard-line, conciliatory and embarrassing speeches concerning the southern secession at these victory stops, as well as dealing with the varied receptions he receives at Albany, Buffalo and New York City, etc. The threat of assassination and possible riots in Baltimore force Lincoln to enter Washington under the cover of darkness. Much to his chagrin, he is ridiculed by the press. His embarrassment at appearing weak and fearful may have disposed him in the momentous coming weeks to avoid steps that might deepen that unfortunate impression. The Lincoln's arrival in Washington generally helps lift the spirits of the city's inhabitants and the North. Despite his efforts to help reach some kind of compromise, the much touted Peace Conference ends in failure and acrimony. Meanwhile Lincoln works on his all important inaugural address; fielding suggestions from close colleagues and deflecting efforts by Seward to make it more bellicose. At this time he also completes the struggle to fill his cabinet; an effort that leaves him both annoyed and depressed. On inauguration day all goes as planned without any violence or disruption, but the country is now too divided, and while the North receives his address positively, the South views it as incendiary and aggressive. Lincoln's first six weeks in office tax him to his limit as he must deal with two all consuming issues: making the fateful decisions regarding war and peace while at the same time dealing with importunate place hunters thronging the White House. To his rescue, comes John Nicolay, who will become Lincoln's personal secretary and confidant, along with Nicolay's assistant John Hay, another young man who will do yeoman's work for the president. While most of his patronage appointments are well received by the Washington establishment, balancing regional, local, ethnic, political and personal priorities, some turn out to be terrible mistakes that will haunt Lincoln throughout his tenure. All this, while the Fort Sumter crisis simmers ominously.